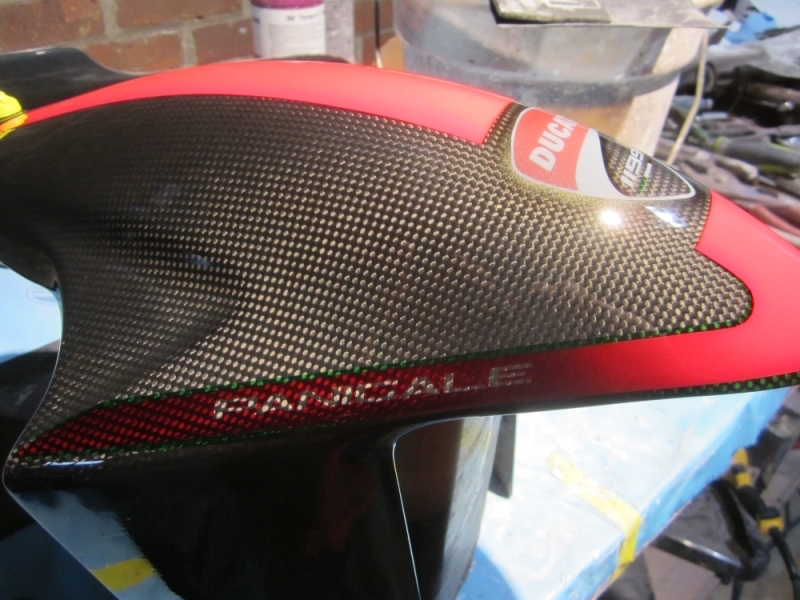 Picture 1: You can see the transition between ducati red and the candy red in the Panigale stripe. Also you can see a hint of the prism pearl gold that surrounds the Corse' logo. Candy green can be seen above and below the Panigale stripe. Picture 2: Here the prism pearl gold surrounding the Corse' logo vistually disappears and you can actually see the candy black under the prism pearl gold! You can also see the faint black dropped shadow under the white "swoosh" inside the corse' logo. Picture 3: Very detailed close up of the transition between a solid color and a candy color, also the green candy. Picture 4: Close up of the Corse' logo, at an off angle, the prism pearl makes a prominent reappearance. The logo itself was sprayed 1/2 strength to still retain a hint of the CF showing through all the colors. 7 coats of high solids clear in two applications. 8-1/2 hours to complete the job start to finish.